How many calories are in Gentle? The Gentle Fish variety has 331 calories per 100g. It is important to remind people that you only need to feed 1-1.2% of an adult dogs body weight per day. 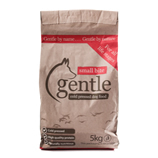 So with normal Gentle a 10KG dog would only need 100g in a day which comes to 359 calories. We recommend feeding adult dogs 1-1.2% of their bodyweight and puppies 2.5%. This figure should be increased with activity levels. Why shouldn’t I store Gentle in an AIRTIGHT container? 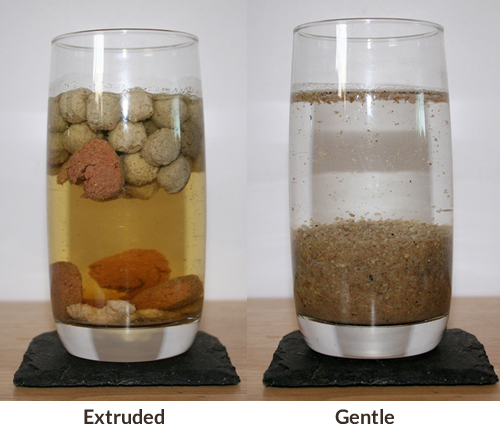 We are very proud to call Gentle NATURAL and therefore storing it in airtight containers can have unwanted problems. The food can sweat when denied air circulation which can then mean the food's shelf life is reduced and the food can deteriorate much quicker. We also recommend storing in a raised position and NOT on a solid floor or in direct sunlight, as this provides cooler storage with better air circulation. 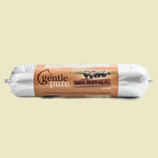 Is the meat in Gentle raw? No - under EU regulations all the meat in cold pressed dog food must be thermally pre-treated to prevent any harmful bacteria etc. from entering the manufacturing process. For more information please contact us. Is the rice in Gentle cooked? Do I need to add water to the food? 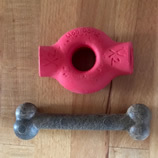 No - Gentle is a complete dry food so water does not need to be added however water must be available at all times for the dog. What is the difference between Gentle and extruded food? Cold pressed foods like Gentle do not undergo the punishing high heat extrusion process. This means the food retains more of the key nutrients and ingredients vital to a healthy balanced diet. 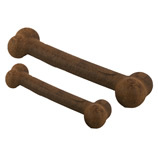 On top of that cold pressed breaks down a lot easier in the dog's stomach than its extruded rivals helping digestion. As seen in the below photo Gentle Cold Pressed absorbs water very easily and therefore breaks down much faster than the extruded food which swells up. Second feeding of my dogs with Gentle. Oscar takes over Zenna’s bowl. This has never happened before!!! Both love the food and tummies are OK.